INSPECTION: Morning of sale from 8:00am to 10:30am. 1998 LeBlond Makino A55/128 Delta Multi Pallet CNC Horizontal Machining Center s/n LM-0529 w/ Makino Professional 3 ( Fanuc Series 16-MC ) Controls, 128-Station ATC, CAT-40 Taper Spindle, 14,000 RPM, Full 4th Axis Thru Pallet, 15 5/8” x 15 5/8” Pallet, Chip Conveyor, Coolant. 1997 LeBlond Makino A55/128 Delta Multi Pallet CNC Horizontal Machining Center s/n LMO-623 w/ Makino Professional 3 ( Fanuc Series 16-MC ) Controls, 128-Station ATC, CAT-40 Taper Spindle, 14,000 RPM, Full 4th Axis Thru Pallet, 15 5/8” x 15 5/8” Pallet, Chip Conveyor, Coolant. 1995 LeBlond Makino A55/60 Delta Multi Pallet CNC Horizontal Machining Center s/n LM-404 w/ Makino Professional 3 ( Fanuc Series 16-MC ) Controls, 60-Station ATC, CAT-40 Taper Spindle, 14,000 RPM, Full 4th Axis Thru Pallet, 15 5/8” x 15 5/8” Pallet, Chip Conveyor, Coolant. 1992 LeBlond Makino A55/40 Multi Pallet CNC Horizontal Machining Center s/n LM-0144 w/Makino Professional 3 ( Fanuc Series 16-MC ) Controls, 40-Station ATC, CAT-40 Taper Spindle, 12,000 RPM, Full 4th Axis Thru Pallet, 15 5/8” x 15 5/8” Pallet, Chip Conveyor, Coolant. LeBlond Makino 33-Station Automatic Pallet Changer System w/ LeBlond Makino Patlite Signal Display Controls, ( 2 ) Loading Cells, ( 2 ) Pallet Cars and Track System. 2000 LeBlond Makino A55-E Multi Pallet CNC Horizontal Machining Center s/n 278 w/ Makino Professional 3 ( Fanuc Series 16-MC ) Controls, 225-Station ATC, CAT-40 Taper Spindle, 14,000 RPM, Full 4th Axis Thru Pallet, Kanto Seiki Oilmatic Cooling Unit, 15 5/8” x 15 5/8” Pallet, Chip Conveyor, Coolant. 2000 LeBlond Makino A55-E Multi Pallet CNC Horizontal Machining Center s/n 578 w/ Makino Professional 3 ( Fanuc Series 16-MC ) Controls, 181-Station ATC, CAT-40 Taper Spindle, 14,000 RPM, Full 4th Axis Thru Pallet, Kanto Seiki Oilmatic Cooling Unit, 15 5/8” x 15 5/8” Pallet, Chip Conveyor, Coolant. CAT-40 Taper Spindle, 14,000 RPM, Full 4th Axis Thru Pallet, 15 5/8” x 15 5/8” Pallet, Chip Conveyor, Coolant. 1997 LeBlond Makino A55 Delta Multi Pallet CNC Horizontal Machining Center s/n LMO-0686 w/ Makino Professional 3 ( Fanuc Series 16-MC ) Controls, 208-Station ATC, CAT-40 Taper Spindle, 14,000 RPM, Full 4th Axis Thru Pallet, 15 5/8” x 15 5/8” Pallet, Chip Conveyor, Coolant. 1995 LeBlond Makino A55 Delta Multi Pallet CNC Horizontal Machining Center s/n A95-686 w/ Makino Professional 3 ( Fanuc Series 16-MC ) Controls, 208-Station ATC, CAT-40 Taper Spindle, 14,000 RPM, Full 4th Axis Thru Pallet, 15 5/8” x 15 5/8” Pallet, Chip Conveyor, Coolant. Sensor System, Zeiss VAST-XT Probe System, 6-Station Stylus Rack, Zeiss Joystick Controller, =1200mm (47.24”), Y=1800mm (70.86”), Z=1000mm (39.37”) Work Envelope, Stylus Heads and Probes, Zeiss Operating Software and Computer. Starrett RGC 4028-24 CMM Machine s/n S-5099 w/ Renishaw MIP Probe Head, Renishaw Probe Tips and Acces, Computer and Printer. Nikon mdl. 6C 11” Bench Model Optical Comparator s/n 41479 w/ (3) Objectives 50X, 20X and 10X, Surface and Profile Illumination. (2) Bausch & Lomb Stereo Microscopes w/Light Sources. Mitutoyo 24”, 18” and 12” Dial Height Gages. Mitutoyo 80” and 40” Vernier Caliper. Mitutoyo Digital Drop Indicators and Granite Bases. Mitutoyo 0-6” OD Mic Set. Mitutoyo OD Mics 11”-12”, 9”-10”, 7”-8”, 6”-7”. Mitutoyo Bore Mics .5” to 4.0”. Etalon Bore Mics .8” to 1.6”. Mitutoyo 1”-2” and 0-1” Thread Pitch Mics. Pyramid 48” x 48” x 6” Granite Surface Plate w/ stand. 36” x 48” x 5” Granite Surface Plate w/ Rolling Base. Starrett 32” x 32” x 6” Granite Surface Plate w/ Rollng Base. 26” x 36” x 4” Granite Surface Plate w/ Granite Legs. Starrett 18” x 24” x 4” Granite Surface Plate. 2000 Fadal VMC6030HT CNC Vertical Machining Center s/n 031988020135 w/ Fadal CNC88HS Controls, 21-Station ATC, CAT-40 Taper Spindle, 10,000 RPM, 4th Axis Prewire, Rigid Tapping, 30” x 62 ½” Table, Coolant. 1996 Supermax MAX-8 REBEL CNC Vertical Machining Center s/n 608013 w/ Fanuc Series 0-M Controls, 24-Station ATC, CAT-40 Taper Spindle, 7500 RPM, Hand Wheel, 29 ¾” x 67” Table, Coolant. Supermax YCM-FV102A CNC Vertical Machining Center s/n 004113 w/ Fanuc Series 18-M Controls, 24-Station ATC, CAT-40 Taper Spindle, 10,000 RPM, Chip Auger, Coolant. Supermax YCM-FV102A CNC Vertical Machining Center s/n 907021 w/ Fanuc Series 18-M Controls, 24-Station ATC, CAT-40 Taper Spindle, 10,000 RPM, Chip Auger, Coolant. 2000 Akira Seiki SV-800 CNC Vertical Machining Center s/n 00VG914-386 w/ Mitsubishi Controls, 30-Station ATC, CAT-40 Taper Spindle, 17 ¼” x 37 ½” Table, Coolant. 2000 Akira Seiki SV-800 CNC Vertical Machining Center s/n 00VG881-339 w/ Mitsubishi Controls, 30-Station ATC, CAT-40 Taper Spindle, 17 ¼” x 37 ½” Table, Coolant. 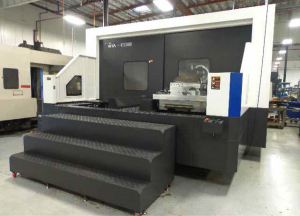 2000 Akira Seiki APC600 2-Pallet Capable (NO PALLET CHANGER) CNC Vertical Machining Center s/n 006AP084-195 w/ Mitsubishi Controls, 24-Station ATC, CAT-40 Taper Spindle, 8000 RPM, 15” x 30” Pallet, Chip Conveyor, Coolant. 2000 Akira Seiki TC-500 CNC Vertical Drilling/Tapping Center s/n 00D007198-374 w/ Mitsubishi Controls, 12-Station ATC, BT-30 Taper Spindle, 8000 RPM, 12 ½” x 19 ½” Table, Coolant. 2000 Akira Seiki TC-500 CNC Vertical Drilling/Tapping Center s/n 00D003161-295 w/ Mitsubishi Controls, 12-Station ATC, BT-30 Taper Spindle, 8000 RPM, 12 ½” x 19 ½” Table, Coolant. 2000 Akira Seiki TC-500 CNC Vertical Drilling/Tapping Center s/n 00D003160-296 w/ Mitsubishi Controls, 12-Station ATC, BT-30 Taper Spindle, 8000 RPM, 12 ½” x 19 ½” Table, Coolant. 10,000 RPM, 16” x 19 ½” Rotary Indexing Pallet, Coolant. 1997 Enshu “DLT Center” Type DT-CL 2-Pallet Sliding Bridge CNC Vertical Machining Center s/n 569 w/ ENAC-I (Yasnac i80) Controls, 16-Station ATC, BT-30 Taper Spindle, 10,000 RPM, Hand Wheel, 16” x 19 ½” Rotary Indexing Pallet, Coolant. 1997 Enshu “DLT Center” Type DT-CL 2-Pallet Sliding Bridge CNC Vertical Machining Center s/n 469 w/ ENAC-I (Yasnac i80) Controls, 16-Station ATC, BT-30 Taper Spindle, 10,000 RPM, Hand Wheel, 16” x 19 ½” Rotary Indexing Pallet, Coolant. 1990 Fadal VMC4020-28 CNC Vertical Machining Center s/n 9009529 w/ Fadal CNC88 Controls, 21-Station ATC, CAT-40 Taper Spindle, 10,000 RPM, 28” Extended “Z” Axis, Coolant. 1987 Fadal VMC4020 4-Axis CNC Vertical Machining Center s/n 8711962 w/ Fadal CNC88 Controls, 21-Station ATC, CAT-40 Taper Spindle, 10,000 RPM, Coolant. Coolant.1992 Lagun “Lagunmatic 310” CNC Vertical Mill s/n 30712 w/ Dynapath Delta Series Controls, 40-Taper Spindle, 10” x 50” Table.